Distinguished by giant BirdieBall inflatable chipping targets (such as the vibrant Golfrilla and BirdieRex), putting contests and other interactive attractions, the Junior Golf Experienceprovides multiple opportunities for juniors to get excited about the game and win prizes. Beyond fun, however, the area introduces adults and their charges to the groundbreaking programs created by the Junior Golf Alliance of Colorado (JGAC). Now entering its fourth season, the JGAC is the “North Star” of junior golf in Colorado, according to Ed Mate, executive director of the Colorado Golf Association—which joined with the Colorado PGA to create the JGAC. The JGAC has quickly become a model for junior golf programs across the country, with its website (juniorgolfcolorado.org) serving as a one-stop shop for all things junior golf. For parents and kids interested in competitive junior golf, the Alliance provides a comprehensive resource (including holding four Major Championships, identifying in-state national qualifying events, locating instructors and providing counsel on college scholarships). As a result of JGAC participation in the Drive, Chip & Putt Championships, threeColorado players qualified to compete at the national finals at Augusta National Golf Club in April! But the JGAC isn’t just for budding Jordan Spieths and Lydia Kos. It’s about building the ranks of all junior golfers. More than 20,000 kids annually participate in its developmental Golf in Schools and the PGA Junior League programs, as well as in its instructional camps, clinics and age-specific Junior Series events. At this year’s Denver Golf Expo, the JGAC will again change the game by making it more affordable for kids to play. Youth on Course, a national program that allows kids ages 6-17 to play a round of golf for $5 at specified times, will be available at more than 30 courses in Colorado—and possibly the seven City of Denver courses. That’s twice the number of courses that participated when the program was implemented in 2018. 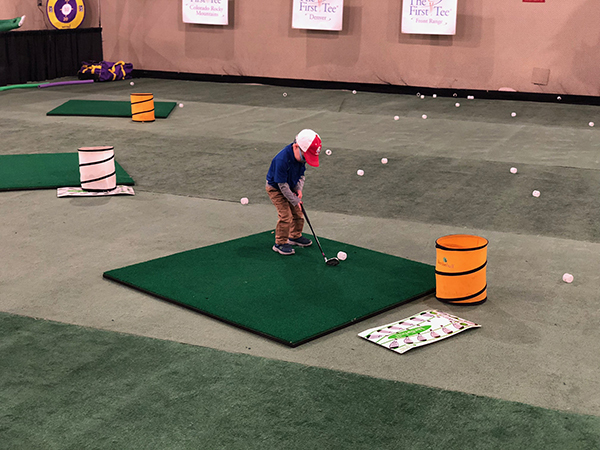 To open those doors—and many others—for the kids in your life, visit the huge Junior Golf Experience area to the right as you enter the Denver Golf Expo.